They destroy your motivation and leave you feeling completely drained. They’re not good for anything, except for maybe increasing your chances of getting a zombie role in the Walking Dead. I know because I was plagued with 3-4 headaches a week. That’s until I learned how to cure them with an insanely effective technique called trigger point therapy. Since then, trigger point therapy has been my go-to headache cure. And best of all, I can do it within the comfort of my own home. I know headaches are a huge problem for a lot of you out there, so I figured I would share this little-known trick. That way you can finally be headache free, without the need of medication. During my work under a naturopathic doctor, about 95% of the patients who showed up for headaches or migraines had them as a result of muscle tension (tension headaches). People are often unaware their headaches are caused by muscle tension because it’s not obvious to those who experience them. As odd as it may sound, when a muscle tightens up it can cause pain in a completely different area. So when your neck muscles are tense and can’t relax , it can cause pain on the top of your head, temples, or in the front of the head depending on which specific muscles are tense. The problem is, it’s easy to mistake referred muscle pain for a regular headache or migraine. That’s why so many people have tension headaches and don’t realize it. Tension headaches can cause a dull, or very painful, aching pain anywhere in the head, neck, or shoulders. This pain is usually accompanied by a feeling of tightness or pressure in the same areas. The level of pain changes as you move your head or shoulders. You wake up with headaches or seem to get them when you are stressed out. The muscles in your neck, shoulders, or upper back are sensitive to touch or pressure. You spend a lot of time on your smart phone, on the computer, or have a job that requires you to sit all day or look in a single direction. Your muscles can get tight for a number of reasons including stress, a magnesium deficiency, or even a job with repetitive motions (e.g., office jobs). Muscle knots feel almost like a hard lump sor ball of muscle. The fancy name for muscle knots is myofascial (muscle) trigger points. See where this is going? Once you locate your muscle “knots” or trigger points, you can apply gentle and gradual pressure to them. If done correctly, this pressure will eventually cause the trigger points and their associated muscle relax. When a trigger point releases, you can feel the tension melt away. It’s like a wave of relaxation. So if you think you suffer from tension headaches, here are the 4 different trigger points you can learn to melt away your headaches all by yourself. The great thing about learning how to relieve headaches using trigger points is that once you learn it, you can use the technique anytime and anywhere—there’s no need to depend on any medication or massage therapists. So lets move on to step 1: finding the common trigger points. The suboccipitals are 4 tiny muscles located below the base of your skull near your two large neck muscles. They help move your head up and down. People who spend a long time looking down at their smartphones or hunched over their computer screens most of the day almost always have tension in their suboccipitals. Similar behaviors can also cause your psoas muscle to shorten which leads to lower-back pain. When I was in college, I had to complete most of my work on a computer. As a result, I often had problems with suboccipital tension until I learned how to work on the trigger points and improve my posture. Find the center of your spine on your neck and drag your fingers left or right until you feel a large neck muscle (upper trapezius). It’s easier to find if you move your head up and down while trying to feel for the big band-like muscle. Now follow the band of muscle all the way up to the base of your skull. When you are there, move your fingers slightly to the outside of the big muscle (away from the spine). You should be able to feel a small indent here. This is the area you want to remember. Try to find it on the other side of your neck too. These points are also called the Gates of Consciousness (GB 20) in acupuncture & acupressure. Once you locate your suboccipitals, you can feel around for any tenseness and locate any knots that may be causing your head pain. The sternocleidomastoid, or SCM for short, is a long neck muscle that helps your head rotate. It also connects to your clavicle (collar bone) to help you breathe. The SCM is located on both sides of your neck. When someone spends a lot of time in the head forward posture, it shortens and tenses the SCM. If this posture becomes a habit, the SCM will adapt and shorten (tighten). A tight SCM can refer pain to the forehead, sinus, ear, near the eyebrows, or back of the head. People with a tight SCM usually have jobs that involve a lot of sitting with poor posture. The SCM begins below your ears. If you turn your head in the opposite direction of the side you are feeling, you will find it faster. It feels like a solid band of muscle. Once you find it, keep your head turned and follow it all the way down until you hit your clavicle. You can then feel up and down SCM for any trigger points. Some of the common trigger points can be seen in the picture above. Turn your head left and right while searching for trigger points—it makes things much easier for you. A common trigger point that I dealt with can be found about two fingers down from where your SCM meets your skull. Sometimes my ear aches are caused by this trigger point. Be careful with the SCM when you are massaging trigger points. There are small sensitive muscles in this area and the carotid arteries are very close to the SCM. So always massage gently, and never apply a lot of pressure to the trigger points. If you are unsure, let a professional such as a naturopath or physical therapist show you first. The trapezius, commonly called traps, is a large kite-shaped muscle that spans from your upper shoulders all the way down to the middle of your back. The trapezius helps pull the shoulders up and stabilize the neck. Continuous slouching can cause the traps to tense up and form serious knots in your shoulders. Tense shoulders can also start a chain reaction of muscle tension that leads up to your neck and suboccipitals. A tight trapezius can refer pain to the back of the neck or ear, the temples, or even the back of the eye. The upper trapezius itself isn’t difficult to find. But it’s a big muscle so it may be hard to find the trigger points you are looking for. This band is really the top of your trapezius. Usually there are knots here, so it should be easy to find. Once you find the trigger points, you can feel the top of the muscle as it travels away from your neck into the bony part of your shoulders which is the top of your clavicle (acromial extremity). 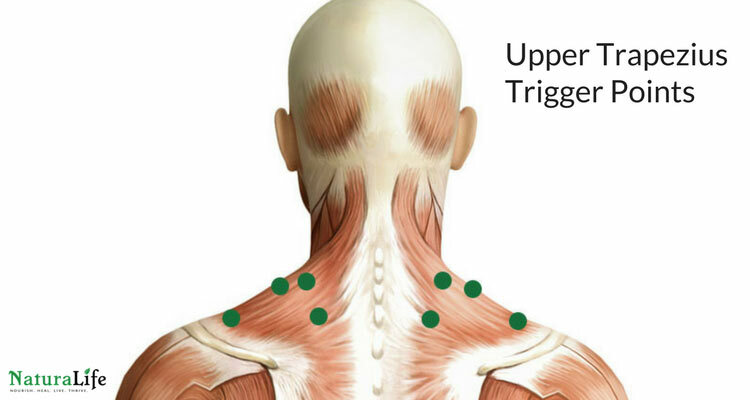 Most of the trigger points will usually lie close to the base of your neck. The rhomboids are muscles that start at the middle of your spine and connect to the scapula. These muscles help move the scapula and counter the pull from your pectorals (chest muscles). Much like the SCM, the rhomboids can become tight when you spend long periods of time in the head forward posture. Tight rhomboids can also be caused by tense pectorals. Since the pecs and rhomboids counter one another, if the pecs are too tight, it will put more stress on the rhomboids and vice versa. Unlike the other muscles described here, the rhomboids usually do not refer pain to another location. Instead, pain is usually felt around the middle back and scapula. But tense rhomboids can cause other muscles in the area to tense up which causes a chain reaction of muscle tension that can lead up to the neck. These may be the most difficult of the trigger points to find only because they are hard to reach on your own. 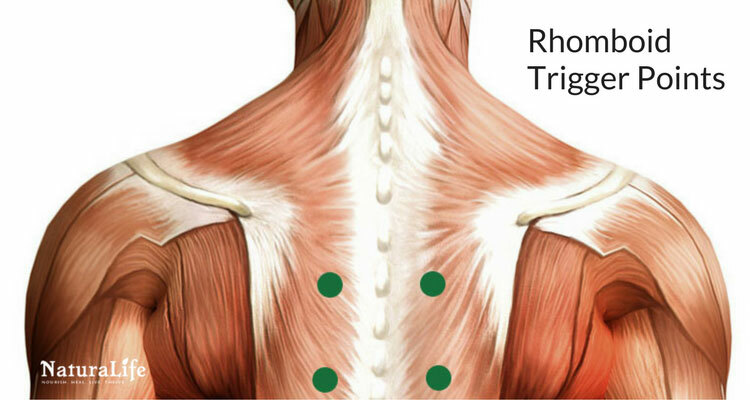 But if you own a self-massage tool, rhomboid trigger points are much easier to release. To find rhomboid trigger points, start by locating your scapula—typically as far as you can reach is where the rhomboids are unless you have poor flexibility. Once you are there, just do your best to scan with your fingers between the scapula and your spine for any trigger points. If you find a spot that you can’t quite reach, you can also try laying on a tennis ball or golf ball and gently rolling on the spot. The technique you use to release trigger points or muscle knots is the most important thing you should learn from this article. When you first start, it may be difficult to find trigger points, but over time you will be able to pick them out right away. I’m at the point where I catch myself pressing on a trigger point intuitively without even being aware of it. Scan the muscle with your fingers and find a trigger point. They usually feel like a tight “ball” of muscle and are tender to touch. Lightly apply pressure to the trigger point while taking deep breaths (the breathing is important). Slowly increase the amount of pressure on the trigger point. If it causes too much pain, ease off a little. It’s best to apply pressure until discomfort. Once the discomfort subsides, gradually apply more pressure. Continue to repeat this process. You eventually should feel the trigger point “melt” away. Scan the nearby area to see if the trigger point moved—sometimes those darn trigger points will try to run away from you. If a trigger point is stubborn, try moving the area that engages the muscle while pressing on the point until you feel like trigger point is exposed or more prominent. For example, when working on my suboccipitals, I move my head in all different directions while pressing on a trigger point until I find the most sensitive position and work on it from there. 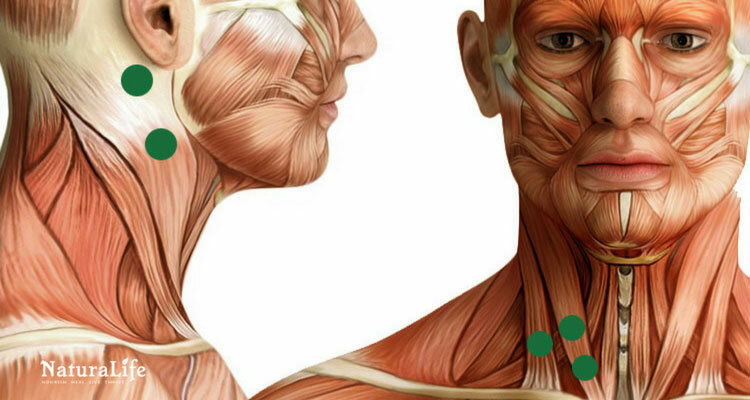 Work your way through all the trigger points you find and through the muscles I mentioned. Feel free to explore other areas. Eventually your intuition will guide you as it does with me. Hopefully you are now headache free (or will be within 15-20 minutes). Remember that it takes practice to get good at this–you may not get great results on your first try. 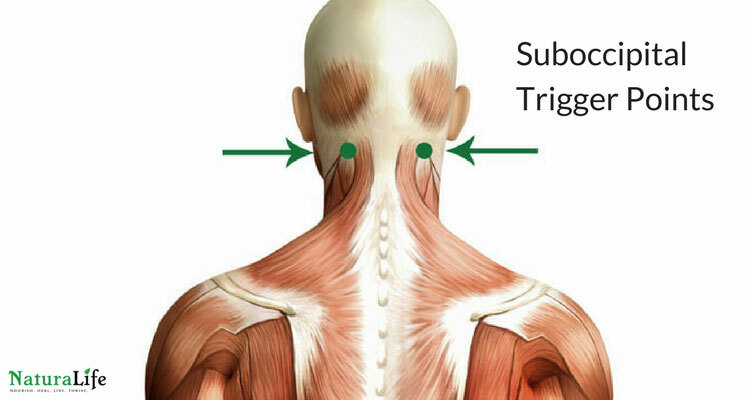 While trigger point therapy can provide substantial relief from tension headaches, it’s important to figure out the root cause—otherwise your muscles will just tighten up weeks after you release them. For many (like myself), it was my posture, stress, and a magnesium deficiency that was causing my muscles to tighten up. To determine if posture is the issue, think about how you spend the majority of your time. If it involves sitting or looking in one direction for prolonged periods, your posture may be the issue. To avoid muscle tension caused by posture, try to walk around every 30 minutes or so (using a tomato timer helps). Regular movement prevents muscles from staying in a shortened state for too long (this causes muscle tension problems). Above all, make sure you have good posture while you are at your job, computer, looking at your phone, etc. There is definitely a lot more to know about this subject, so please feel free to comment below with any questions or suggestions that you may have. After all, this a community that is meant to help you heal. Sounds and looks exactly like where my migraines start. They are TERRIBLE! That sounds terrible! I’ve had similar things happen (but they weren’t triggered by a massage). Your doctor will likely refer you to a physical therapist, which should help–I like to find PTs that are trained in trigger point therapy for these kinds of things but it may not be necessary. It’s hard to tell without knowing exactly went wrong with your neck muscles. Some naturopathic doctors are also well trained in trigger point therapy. So that’s another option if you get desperate. The self-trigger point therapy explain here is for more minor issues (tension headaches) and preventing headaches. But considering your issue has lasted so long, its probably best to get a professional to sort it out. Thanks for the comment and hopefully you get healed up soon! timing of trigger point therapy is really important. If you have a headache or are starting to have one, increasing blood flow can make it worse. Balance cold therapy vs warm. Took me years to figure that out. I went to school for massage therapy and once we started getting into the advanced modalities like acupressure and trigger point and deep tissue I got some pretty intense headaches. Some last for days on end. I learned that when you have a lot of toxins in your body and a lot of pent up stress and emotions they can activate headaches. I think maybe she releases a lot of stuff in your body. It is very crucial to drink like a fish after you get massages and urinate as much as you can before you go to sleep to excrete the toxin that have been released. But also if you were tending up during the massage because it was too deep that too can cause lactic acid to build up in trigger points which cause headaches. Thank you for this post. It’s been so helpful to relax and feel like I’m a human again. Cameron, thank you so much. You are the first to open my eyes up to an approach I haven’t even heard about before! I never go to sleep with headaches, but wake up almost daily with them. 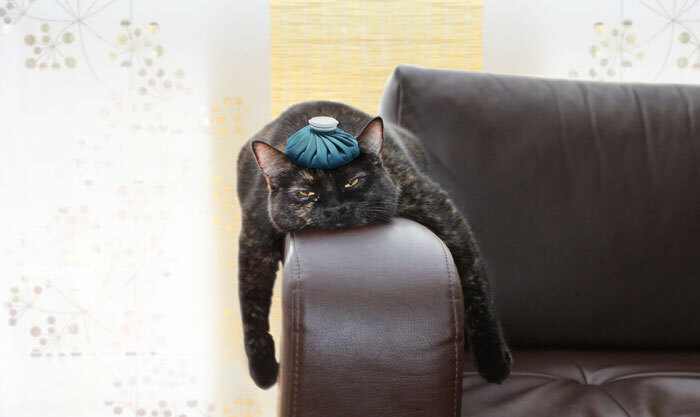 Some days worse than ever, but these “migraine-like” headaches will generally go away after I’m up and moving around. Yes, I do have a lot of muscle tension and my shoulders and trap areas are extremely tight. No one (not even doctors) has suggested that my headaches could be coming from the trigger point areas you have mentioned. It all makes sense to me now. I appreciate your posts and look forward to more for less headache pain. Also, how does magnesium play a role in all this? Thank you kindly! You’re welcome! I love to hear that my content reaches people in need of this info like you. I was in the same boat for years. I got migraines nearly every day. It was miserable to say the least. Tried countless doctors who only wanted to prescribe medication but I got angry because I knew they weren’t addressing the root cause. Eventually I met a naturopathic doctor who revealed to me that they were actually caused by tight shoulder and neck muscles. Ever since then I have learned to release my muscles with trigger point therapy. I still get headaches because I work so much at the computer, but I get way less if I keep up on the work. Oh and you may want to consider lacrosse balls. I’ve had luck using those to get the “knots” out. In regards to the magnesium: Your muscles require electrolytes to tighten and relax. Magnesium is an electrolyte that’s required for the relaxation of muscles among many other things. So if you’re deficient in magnesium, your muscles will be more likely to cramp, have spasms, and be generally tighter. I have knots in my shoulders, neck and head muscles. I’ve used a massager daily but can never truly get rid of them. Any suggestions? You may need help from a professional like a physical therapist, chiropractor, or naturopathic doctor trained in physical medicine to give you a head start. If muscle knots are too bad, doing trigger point therapy on yourself only works for maintenance, unfortunately. You may need a physical therapist or naturopathic doctor trained in physical medicine to get stubborn trigger points out. If knots get too bad, doing work on yourself doesn’t get you very far in my personal experience. But these techniques can still be helpful to combine with professional help.